The most detailed images of Ultima Thule -- obtained just minutes before the spacecraft's closest approach at 12:33 a.m. EST on Jan. 1 -- have a resolution of about 110 feet (33 meters) per pixel. 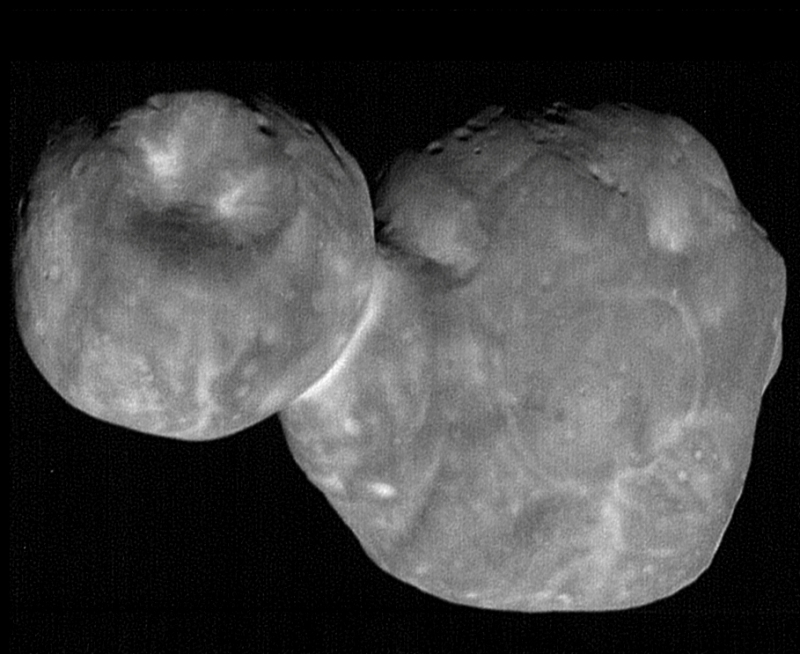 Their combination of higher spatial resolution and a favorable viewing geometry offer an unprecedented opportunity to investigate the surface of Ultima Thule, believed to be the most primitive object ever encountered by a spacecraft. The mission team called it a "stretch goal" – just before closest approach, precisely point the cameras on NASA's New Horizons spacecraft to snap the sharpest possible pics of the Kuiper Belt object nicknamed Ultima Thule, its New Year's flyby target and the farthest object ever explored. 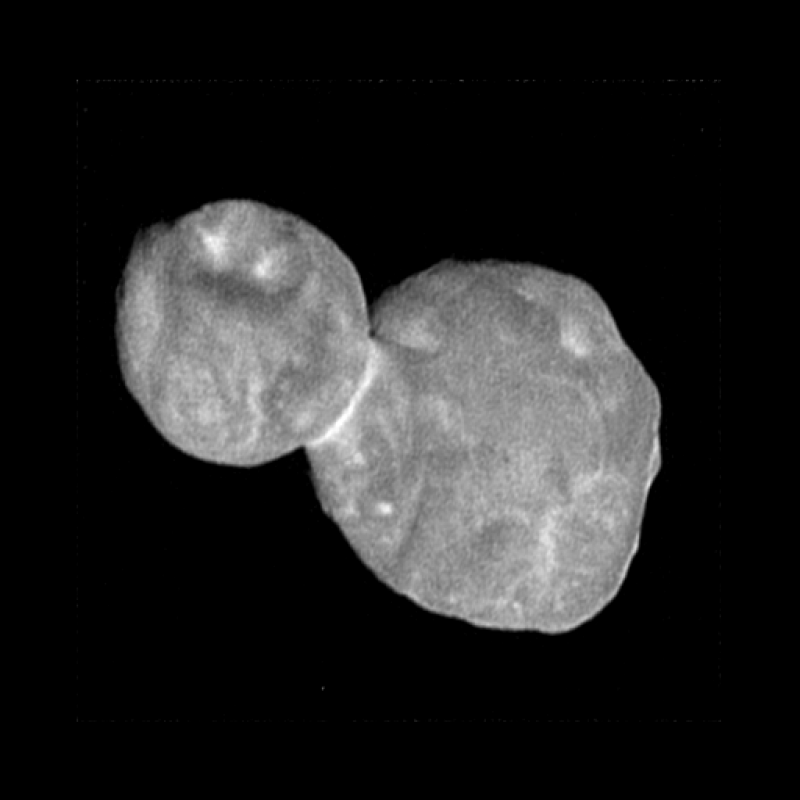 These new images of Ultima Thule – obtained by the telephoto Long-Range Reconnaissance Imager (LORRI) just 6½ minutes before New Horizons' closest approach to the object (officially named 2014 MU69) at 12:33 a.m. EST on Jan. 1 – offer a resolution of about 110 feet (33 meters) per pixel. 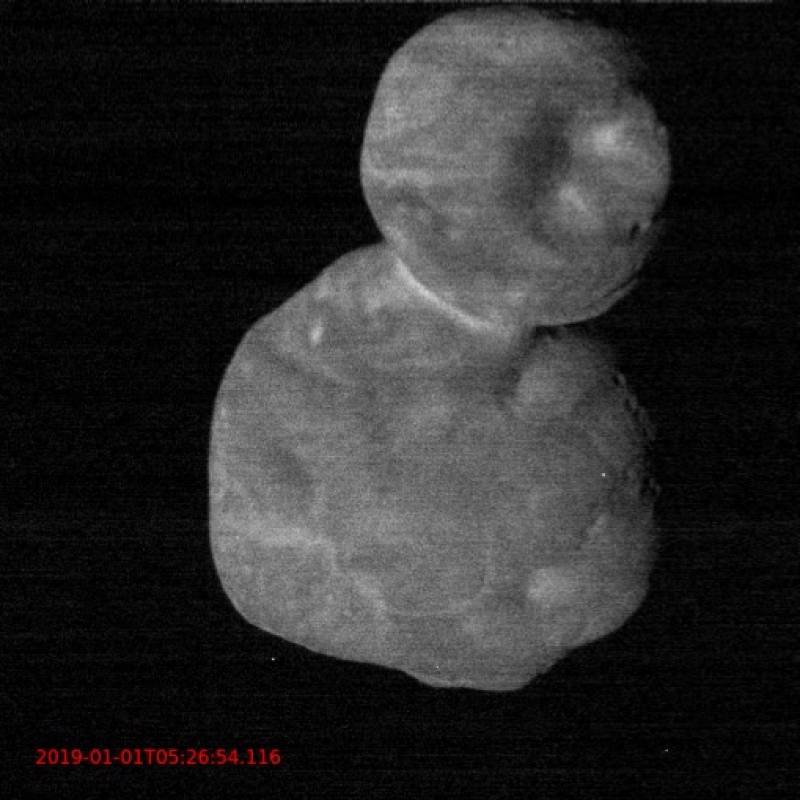 Their combination of high spatial resolution and a favorable viewing angle gives the team an unprecedented opportunity to investigate the surface, as well as the origin and evolution, of Ultima Thule – thought to be the most primitive object ever encountered by a spacecraft. "Bullseye!" said New Horizons Principal Investigator Alan Stern, of the Southwest Research Institute (SwRI). "Getting these images required us to know precisely where both tiny Ultima and New Horizons were — moment by moment – as they passed one another at over 32,000 miles per hour in the dim light of the Kuiper Belt, a billion miles beyond Pluto. This was a much tougher observation than anything we had attempted in our 2015 Pluto flyby. "These 'stretch goal' observations were risky, because there was a real chance we'd only get part or even none of Ultima in the camera's narrow field of view," he continued. "But the science, operations and navigation teams nailed it, and the result is a field day for our science team! Some of the details we now see on Ultima Thule's surface are unlike any object ever explored before." The higher resolution brings out a many surface features that weren't readily apparent in earlier images. Among them are several bright, enigmatic, roughly circular patches of terrain. In addition, many small, dark pits near the terminator (the boundary between the sunlit and dark sides of the body) are better resolved. "Whether these features are craters produced by impactors, sublimation pits, collapse pits, or something entirely different, is being debated in our science team," said John Spencer, deputy project scientist from SwRI. Ultima Thule is smaller than Pluto, but the Ultima flyby was done with the highest navigation precision ever achieved by any spacecraft. This unprecedented precision was achieved thanks to the ground-based occultation campaigns from 2017 and 2018 conducted in Argentina, Senegal, South Africa and Colombia, as well as the European Space Agency's Gaia mission, which provided the locations of the stars that were used during the occultation campaigns. Mission operations manager Alice Bowman, of APL, reports that the spacecraft continues to operate flawlessly. New Horizons is nearly 4.13 billion miles (6.64 billion kilometers) from Earth; at that distance, radio signals, traveling at light speed, reach the large antennas of NASA's Deep Space Network six hours and nine minutes after New Horizons sends them. Follow New Horizons on its trek through the Kuiper Belt. This processed, composite picture combines seven individual images taken with the New Horizons Long Range Reconnaissance Imager (LORRI), each with an exposure time of 0.025 seconds, just 19 minutes before the spacecraft's closest approach to Ultima Thule (officially named 2014 MU69).The image was taken at 5:14 UT (12:14 a.m. EST) on Jan. 1, 2019, when the spacecraft was 10,350 miles (16,694 kilometers) from Ultima Thule, yielding a resolution of 273 feet (83 meters) per pixel. The spacecraft was 4.1 billion miles (6.6 billion kilometers) from Earth. The angle between the spacecraft, Ultima Thule and the Sun – known as the "phase angle" – was 16 degrees.